The International Monetary Fund has slightly relaxed its conditions for the provision of a new loan tranche to Ukraine, removing the demand that Kiev first revise the country's laws on the privatization of agricultural land. Ukraine watchers Vladimir Zharikhin and Alexander Dudchak say that the IMF's move is just a ploy designed to entrap Ukraine. Last week, the IMF confirmed that it would not insist on the immediate implementation of land reform as a precondition for the provision of its next loan tranche to Ukraine in the fall. Speaking at a press briefing on Thursday, IMF spokesman William Murray confirmed that land reform would not be on the agenda for the program revision meeting next month. "Land reform remains an important condition under the program. However, given the need to design the reform well and reach consensus on key steps ahead, there was a need to reset its timing to later in the year," he said. The IMF had earlier insisted that Kiev make changes to its land laws to allow for its privatization. Ukrainian lawmakers have stubbornly and repeatedly rejected these demands. Other IMF loan conditions remain unchanged, and include pension reform, measures to accelerate privatization, and increased efforts against corruption, including the creation of an independent anti-corruption court. IMF conditions also include the requirement that Kiev continues with fiscal reform and restructuring of the energy sector, programs which have led to severe cuts in public spending, and skyrocketing utilities prices. Ukraine has received four loan tranches worth $8.5 billion from the IMF since March 2015, when the program – worth $17.5 billion, was approved. Every successive tranche has been accompanied by long delays due to Kiev's reticence to comply with the IMF's requirements. The latest tranche, originally scheduled to be delivered in May, has now been postponed until September, pending Kiev's compliance with the conditions. In recent weeks and months, some Ukrainian authorities have tried to downplay the significance of the IMF loan program, signaling that it was needed mainly for the purpose of strengthening investor confidence in the country. Last week, Prime Minister Volodymyr Groysman tried a different approach, complaining that Kiev does not have enough money to carry out the promised reforms, since most of the budget is spent on servicing foreign debt, defense and the pension fund. According to Groysman, Kiev now spends approximately 100 billion hryvnia – or 4% of its GDP, on debt servicing, with another 5% spent on security and defense. Kiev is also expecting assistance from the EU in the form of a 600 million euro loan program. This program has its own conditionalities, including a cancelation of the moratorium on the sale of forestry products, and the lifting of import duties on certain goods. 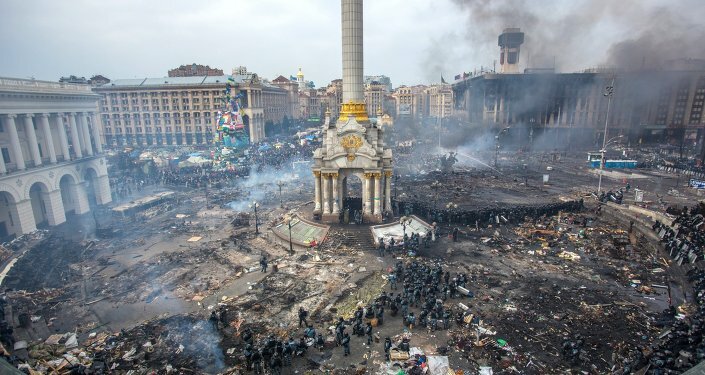 Kiev has until October to meet these conditions. Experts say that without loans from the IMF, Brussels and the US, Kiev will have a more difficult time servicing its gross foreign debt, which currently stands at about $113 billion – or 66.8% of the country's GDP. Public debt amounts to about $72 billion, 70% of that consisting of currency loans. Speaking to the Svobodnaya Pressa online newspaper, Vladimir Zharikhin, deputy director of the Institute of CIS studies, said he was certain that the IMF would end up giving Ukraine its next loan tranche, since the money is needed to help shore up the current regime in Kiev. At the same time, he warned that the IMF will take every opportunity to squeeze Kiev along the path of austerity reforms. "The IMF has a pulse on the situation in Ukraine," Zharikhin said. "They have come to understand that pension reforms can be carried out, because pensioners feel intimidated, and do not pose a serious threat to the regime. As for corruption, this [conditionality] is always restricted to broad terms. A Special Committee on Corruption is functioning, but for some reason does not prosecute anyone. Basically this is just idle talk, while corruption increases. And in fact the IMF does not actively object to this." However, in the case of land reform, this is a sensitive issue for the authorities, according to the analyst, because it "affects the interests of a certain section of Ukraine's political elite…The radical nationalist section of the elite and society opposes abolishing the moratorium on the sale of land, since they fear that land will be bought up by foreigners, including…Russian oligarchs. Therefore, the IMF decided to postpone land reform." In any case, the observer stressed that it was impossible to delay allocating the next loan tranche for long. "The IMF understands that doing so could lead to the complete collapse of the Ukrainian economy and the fall of the current regime." This, Zharikhin emphasized, would not be in the interests of either the Fund itself, or its US sponsors. Put crudely, the observer said that IMF tranches are allocated mainly "to keep Kiev's pants from falling down," and little else. "Factually, this is what they've been doing in the last few years now." Nonetheless, Zharikhin stressed that in the end, the IMF will never back down from any of its austerity demands for good, instead working more closely with Ukraine's political and economic elite to return to the trouble spot when the time is right. For his part, Ukrainian political scientist and economist Alexander Dudchak told Svobodnaya Pressa that whatever else happens, Kiev's "addiction" to IMF loans, and specifically their requirement for major socioeconomic reforms, will have disastrous long-term consequences for Ukraine, even if the country's Maidan-installed authorities were to be removed from power. In the meantime, Dudchak noted that while all of the IMF's conditions will continue to have a painful impact on ordinary Ukrainians' lives, the land issue is a particularly sensitive one. "If the moratorium [on the sale of land] is lifted, nothing will remain of Ukrainian lands. They will not belong to the state or the people. Ukrainian agro-holdings, which today are considered among the country's strongest enterprises, will not be able to compete against transnational capital. Ukraine will be deprived of its land and its population gradually returned to the status of serfs." As far as the current government is concerned, they are delaying land reform only because they would like to write the new laws on privatization with their own interests in mind, Dudchak said. But whatever they end up doing, "it will be hard for them to prevent foreigners from gaining control over farmland and growing whatever they want there, up to and including genetically-modified foods." As for the latest IMF tranche, the economist stressed that it will be spent in its entirety on servicing Ukraine's massive debts. Otherwise, "for Ukraine as a state the benefit from this loan is zero."